Anytime an RPG adventure can make the player care about its characters as much as you would were they characters in a book, TV show, or movie, it’s doing a big part of its job well. The Ys series has almost always had excellent storytelling, and with Ys SEVEN, developed by Nihon Falcom and ported to PC by XSeed Games, it’s more of that same great plot held back a bit only by confusing controls. Ys SEVEN, like most of the entries, features the main protagonist Adol Christin and his sidekick Dogi. It’s an action RPG with real-time battles held together with an incredible soundtrack. This entry originally came out in 2009, or 2010 in North America, on the PlayStation Portable. It received praise from critics and players alike. While it didn’t sell as well as big-name PSP titles, it's 230,000 units sold around the world made it one of the best-selling modern Ys entries, second to only 2012’s Memories of Celceta. If you had no idea that this entry originally came out on PSP, you’d never think that it wasn’t developed for PC. It does seem a little strange, at first, to be playing a handheld port of Ys SEVEN on PC; however, the graphics, sound, and responsiveness all hold up well. You’re able to adjust to most screen resolutions, but the graphics options are limited due to it being a handheld port. However, the character models do well with their simplicity. Another major change from the previous Ys games is that the characters are polygonal as opposed to sprites, but the polygons are well-made models that serve as an example of what well-done 3D models can look like under tight graphical limitations. 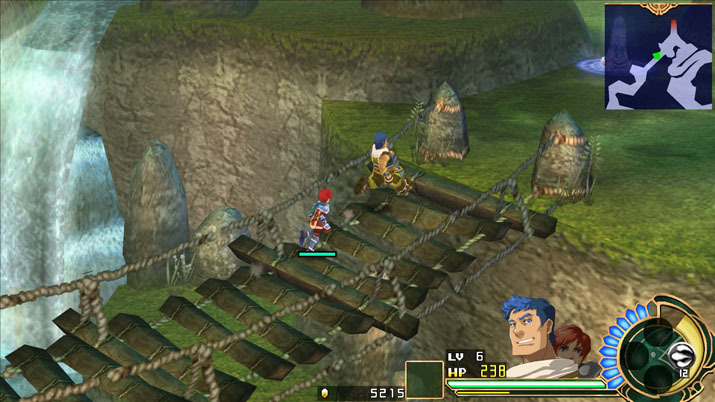 Ys SEVEN starts with Adol and Dogi docking from a giant ship into Altago, where you first get into a disagreement with a thuggish Dragon Knight Commander who arrests and jails you for petty reasons after you attempt to stop his bullying of Tia and Maya. 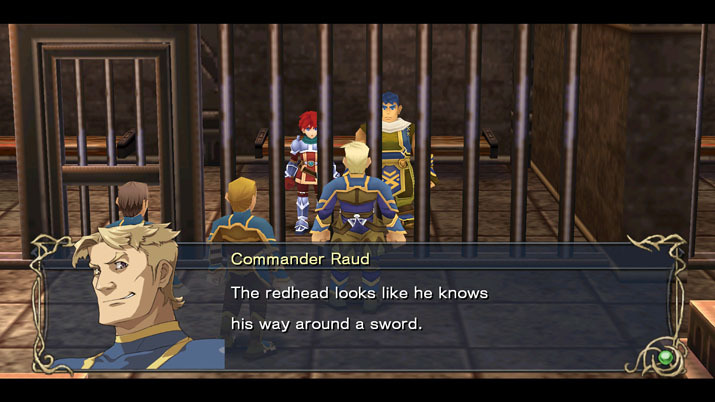 Eventually, you’re bailed out of jail by the king, who knew of Adol and Dogi through one of his old trusted friends. He then asks you to explore an ancient shrine, which serves as the real beginning of the game. While you might get comfortable using Adol or Dogi, it’s important to recognize that you’ll eventually get nine playable characters throughout the story that can play alongside Adol. A new wrinkle to Ys SEVEN was the party system, in which players can bring alongside three different characters into battle, and each character can use a particular weapon type and skills that are attached, or learned, through the weapons. The weapons come in three classes: slash, crush, and pierce, and various enemies are weak against one of the types of damage classes. There are also defensive actions for the first time in the series, and there are multiple ways to defend against enemies, in addition to dodging them. Some characters, for instance, might defend better than they dodge, or dodge better than they defend. The plot retreads the ‘hero tasked with saving humanity’ story arc, however, it does so in an original manner: the rich cast of characters, characters like the previously mentioned Maya and Tia. While other games might have used them in that opening scene to move your action along, never to see them again, here they’re given more fleshed out stories: Maya is stricken with a disease and asks Adol and Dogi to find a way to cure her. I wanted to love this game. But, my problems I had with the controls kept me from considering it one of my favorites. The default configuration, if you’re using a controller, makes using your weapon skills to be a bit of a hassle because they’re mapped to the same button as the dodge. You can remap all of the buttons, but the main issue is that there are more actions than there are buttons. That problem seems odd, considering that this title was originally developed for a controller in mind on the PSP. I also tried using the mouse and keyboard, and while using the powers was much easier, trying to move along the X and Y axes was awkward at times. I got to the first boss inside the shrine with no problem, but fighting him, I yearned to have the thumb sticks to dodge his attacks. You can use both the controller and the keyboard, but that seems like a wonky compromise in how the game is supposed to work. Perhaps if you’re more familiar with Ys games, you will know how to use the controller to make both the weapon skills and the dodges work, but for me, someone who’s played just a few Ys games, it left me puzzled. I also found the opening sequence a little tricky to understand. The captain of the ship tells you to go around Altago and talk with people, and that’s it. You’re left wandering the town talking to everyone, not sure of what you need to do to progress. I thought I found my way finally after I found Tia and Maya, but even then I did not realize that you had to leave their section of the map and re-enter it to load the next cut scene involving the commander. Ys SEVEN is packed with content -- over 30 hours of gameplay, a deep storyline and a catchy soundtrack. If you can master the controls, and you’re a fan of action RPGs, you won’t be disappointed in this port. It surprised me in how well it was optimized for PC, both visually and sound-wise, I was just frustrated at how I couldn’t seem to find a control scheme that made me feel like I had every action mastered. That fact alone makes it not as welcoming to newcomers as it could have been, but, it’s still a solid attempt regardless.